The original painting is available, as are limited edition giclée prints. Free shipping for the original painting! There are 200 signed and numbered prints and 40 artist's proofs in the limited edition. When you make your selection, click on the Add to Cart button to finish your purchase. The San Diego Zoo has the most beautiful lagoon with salmon-pink Caribbean flamingos. Their color is derived from the food they eat which is rich in carotenoid pigments. The palm trees with dappled sunlight, and the colorful reflections in the lagoon provide a cool rich setting for this flamingo's late afternoon stroll. 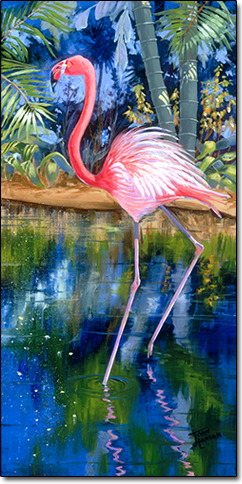 There is also a companion painting, Caribbean Flamingo. The scene flows from one painting to the next. These prints come with a Certificate of Authenticity and are signed and numbered by the artist. For more information on the giclée process, click the link below. D. Size: 24 x 12"